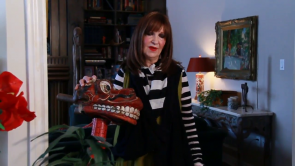 Shaila Gottlieb of MontdorInteriors.com discusses the importance of accessories in Interior Design. In your travels you can pick up pieces that appeal to you and with creative ideas such as framing and shadow boxes, you can use those accessories as wall decorations. Accessories can reflect your tastes, your culture or religion. With global markets opening up, there is so much to chose from. Accessories should be a reflection of who you are, your house doesn’t need to look like a house in a magazine…have fun with it!